A basement egress window is a means of entry/exit from the underground level of your home or business. It must be large enough (as defined by local building codes) to allow a firefighter – in all their gear – entry and exit through this window. 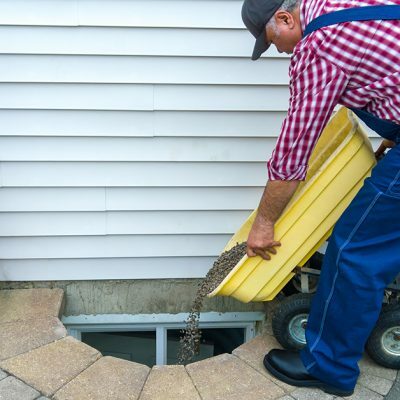 An egress window is usually paired with an egress well and a window well drain with an attached or incorporated ladder for quick and easy escape. Where Does the egress window go? By law, an egress window is required in any bedroom or sleeping area located in the basement of any structure. However, if you are only using the space for entertainment or an office, you technically do not need to install an egress window, but it’s still a good idea to get one installed. Providing your family with a safe escape route from the basement, in case of fire or other emergency, is an important safely improvement that you should consider for your home. These are by and large the standard requirements as set forth in the National Building Code. There may be additional regulations per your local municipality. Window-well pit floor space with minimum dimensions of 36″x 36″ with a minimum floor space of 9sf. The window-well needs a permanent ladder or steps if the window well pit depth is greater than 44 inches. Contact the professionals at Toledo Basement Repair for a free inspection and estimate. (419) 297-6138. We are up to date with the local building codes in our area and are ready to install an egress window in your home. It’s the best thing you can do to keep your family safe while enjoying your home’s basement living space.